I've talked about them a lot but I wanted to do an official "introducing" post for them. Which overwhelms me a bit since there's like... TEN of them and I'm not sure I'll have something to say about every single one, but here we go! 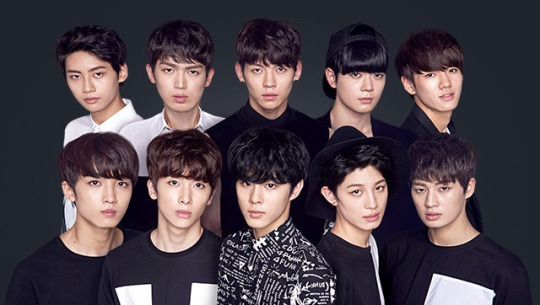 And so, please meet: UP10TION! Man I love the intro on that!! And I still can't believe this was their first song! They are a smallish group and don't get much notice in the kpop world which why I thought they would never come on tour to the US, so when they announced it last spring that they WERE coming, we knew we would be there! And so far, it's been on of the best concerts yet because of it's small venue and intimate audience. Best thing ever. I know I did a huge post about our concert experience, but I didn't share any full fancams so here's one of my favorite songs that they did that night: Runner. Jinhoo, as the oldest is the leader of the group. He has a sweet clear beautiful voice that stands out big time. He is one of the shortest (maybe the shortest?) of the group but has a big personality as we saw during the concert. So witty and funny and full of jokes! He's the one we ended up walking across the street with and didn't even know it. He has an unbelieveable smile. :) According the recent video they made, his favorite thing is coke. 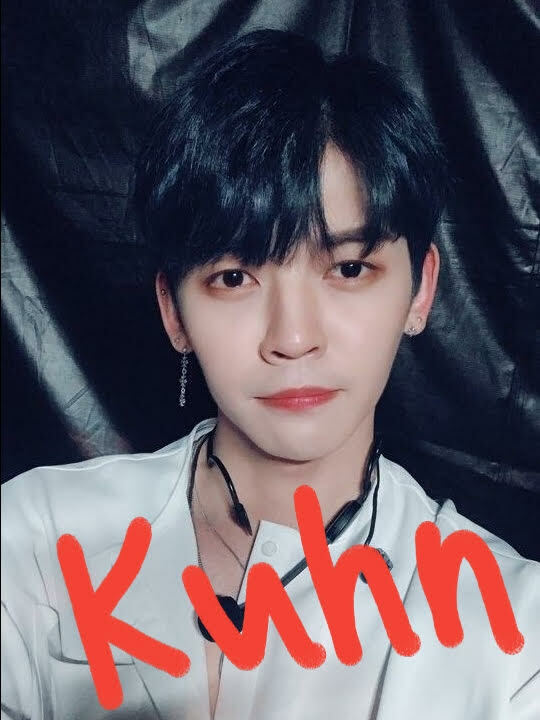 Kuhn, as the second oldest, co-leads with Jinhoo. He is one of the deep voiced rappers... very deep voiced! He is an accomplished flirter and can make everyone swoon without hardly trying. When Megs got her picture taken with him, her assestment... "he is so manly!" Tall and broad. He has beautiful and like them all, a killer smile. According to the recent video they made, his favorite thing right now is shoes. I feel like Kogyeol is one of the more quiet and shyer members of the group. He is tall and has the most beautiful soothing mellow voice ever. It's also hard for me not to take my eyes off him when he dances. In fact, he is the first one of this band that I noticed and paid attention to. And yes...his smile. Dang, but they all have the most gorgeous smiles ever! His favorite thing is coffee! 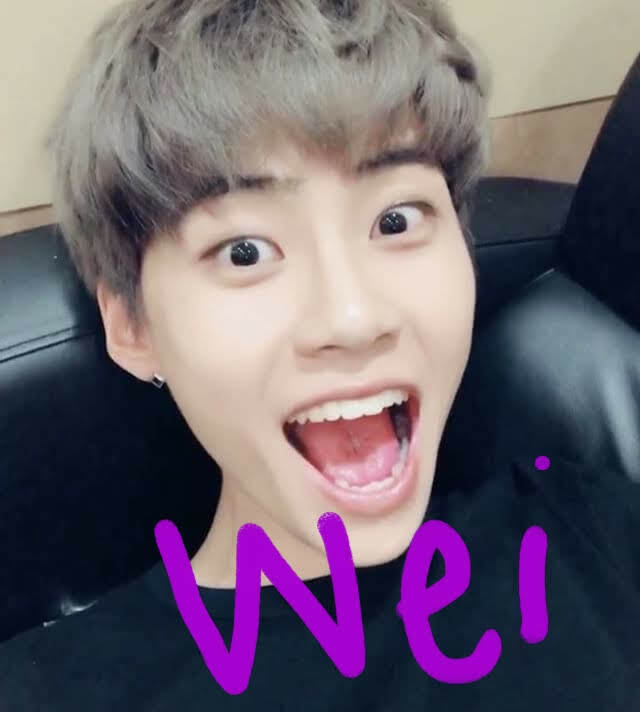 Then there is Wei. I don't even know where to start with him. 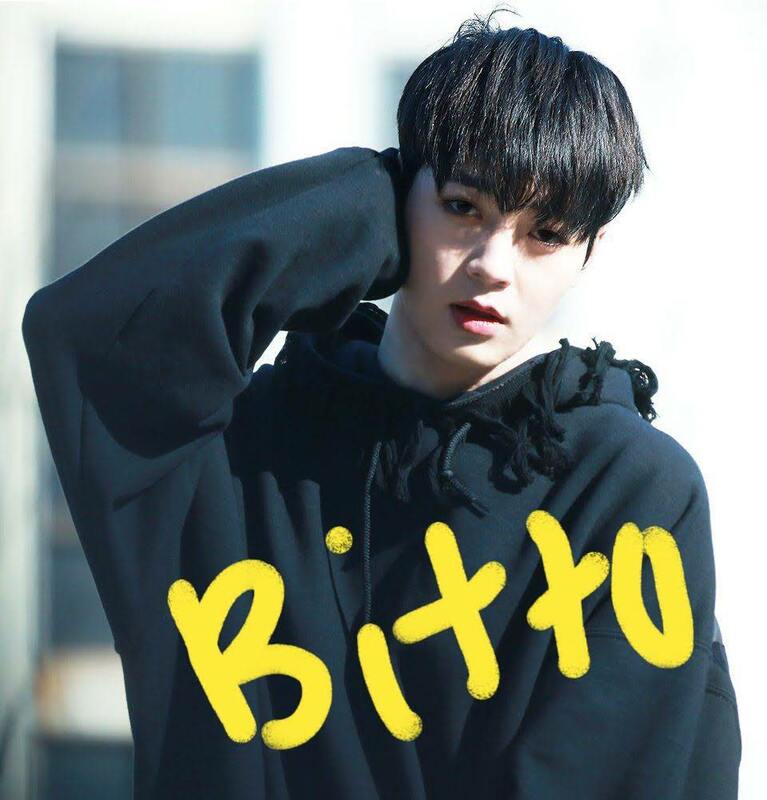 He is another rapper (there are three in this group) and does the high tone rapping, though that just means he is higher then Kuhn and Bitto, not that he sings that high. LOL. He is worked his way (ha Wei) into being my favorite because of his charm, wit, charisma, confidence, smarts, sarcasm, sweetness, cheerfulness, smiley face, huge eyes, silliness, tall lankiness, and... sheesh. Everything. He kills me pretty much. His favorite thing is video games. Bitto is another one that is bit more quiet. (This is just observing from our concert, so maybe it's more or less their English confidence? ) 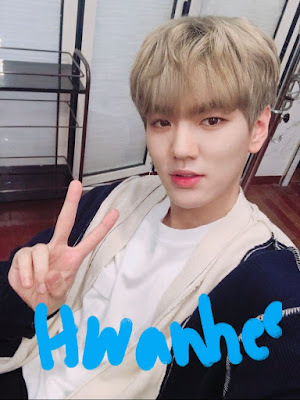 He is the third rapper with a voice that might even be deeper than Kuhn's. I don't know. It's a toss up. But yeah. Bass bass bass! But then when he gets freaked out he screams really high like a little kid. It's hilarious. His favorite thing is hats. 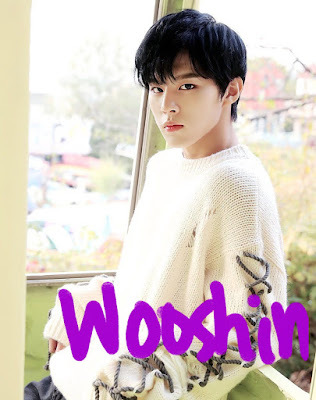 Wooshin has a sort of sad story. Right about the time we were falling in love with this band, there was some sort of "scandal" with him, that was really nothing. But it upset him enough that he took a year off. He deals with the whole anxiety and depression issue anyway, so this thing didn't help. Thankfully, he is now back with the group, but I can tell that he sometimes still feels not all there. He seems sad and withdrawn. Sometimes. I'm sure not always. 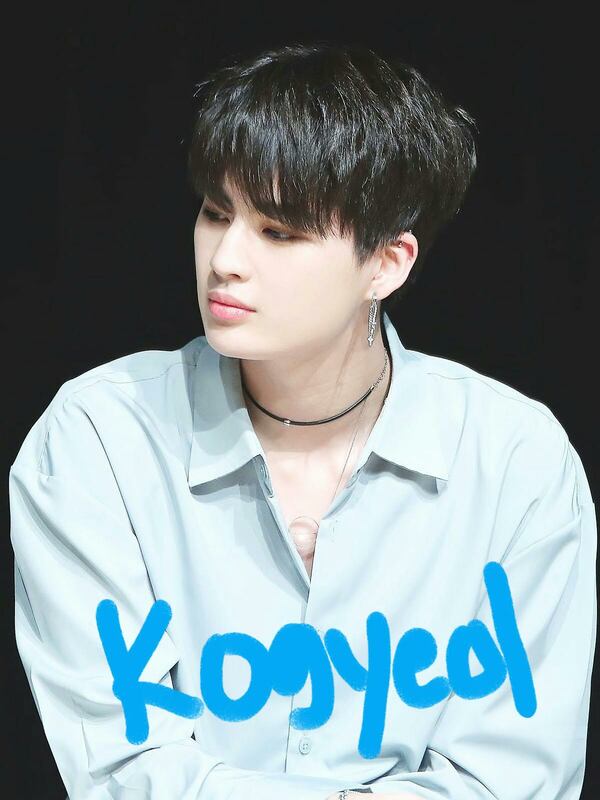 He is beautiful and is the visual of the group. I wish he would smile more often! His favorite thing is sound mixing. Sunyoul is the cutie pie. And he has the highest voice of them all. 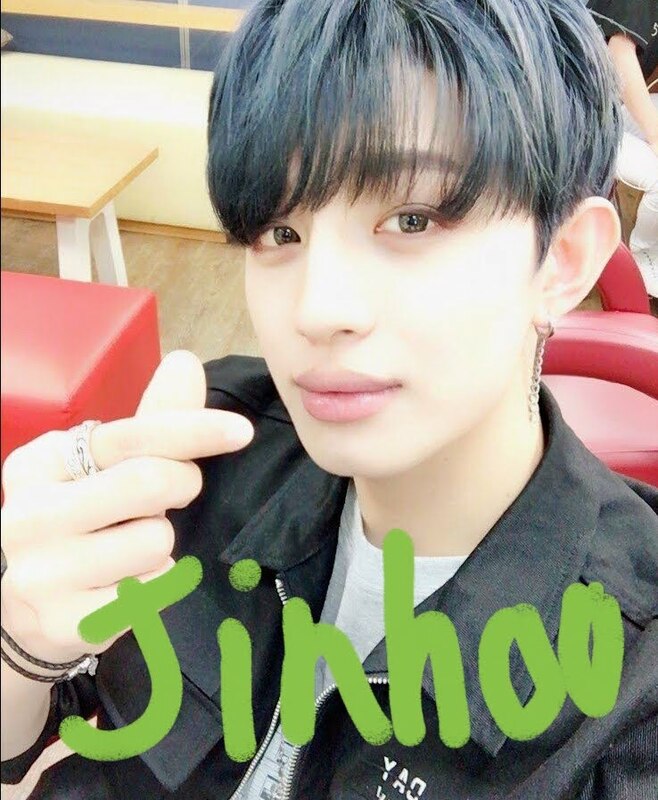 Even higher than Jinhoo's. His voice will blow you away! Chill inducing. He's the belter and I love it! His favorite thing is macaroon cookies. You know the ones from France? 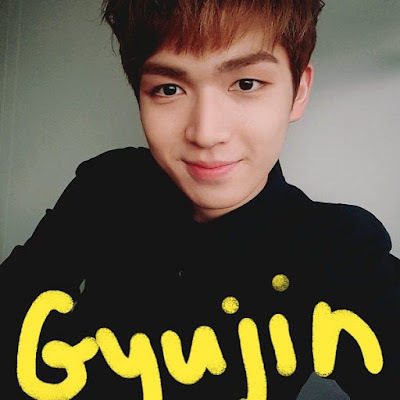 Gyujin, my daughter's favorite dude in ALL of kpop. That's saying a lot! So sweet and down to earth. 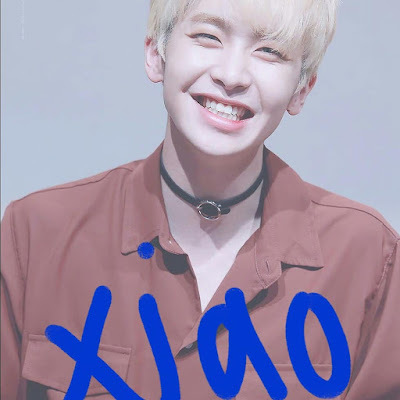 I think of him as a regular kid and not a famous kpop band idol dude, you know? His favorite thing from the recent video? Not totally sure! Bananas? Or cute stuffed animals? Lol! Bottom line, this kid is adorable. Hwanhee is a wrecker for me. He is so sneaky in getting me to pay attention to him. He is another one with a belting kind a voice, so clear and beautiful. Not high like Jinhoo and Sunyoul necessarily, but just pure and clean and clear and strong. I love it when he sings... SO MUCH! 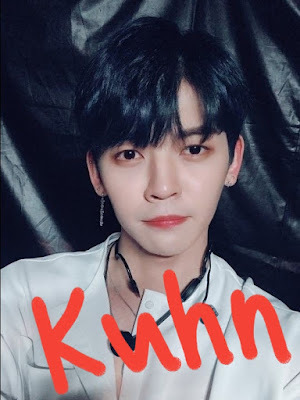 And he too, like Kuhn, has a flirty thing going on that is hard to ignore. Language is no barrier, believe me. Clothes are the thing that he has declared a love for. 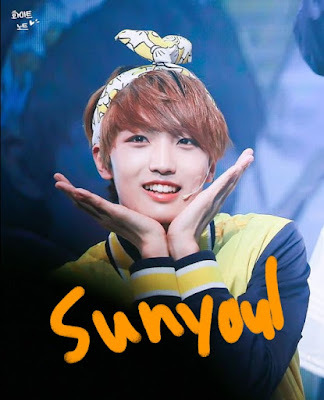 And finally the maknae! The baby! This Xiao with the killer smile and impressive eye smile. Do you see that eye smile there? So cute. His personality fits the baby of the group to a T. He is another sweet vocalist and amazing dancer. When watching him performing, you KNOW he is having the best time of his life! His favorite thing? Ice cream. All these names are stage names except Gyujin and I think Hwanhee. I haven't learned their "real" names yet! AH! The video where it highlights their favorite things is this one if you are interested. It's is taken during a photo shoot and also following them while they were in San Francisco on tour this past summer. I want to share ALL the Up10tion things, but I'll leave at that for this intro post. ENJOY! They are amazing! So of course I dropped the drama I was watching and started this one so we could talk. It's a little older one (like from 2015 I think?) and I hadn't heard any buzz about it and the leads I'd never heard of or seen before, so I was going in totally cold turkey. But it was awesome and just like Jenny said. So cute and fun and emotional and everything! This one is about a dude who is ruthless and awful and demanding and mean and all the bad things. He is the CEO of a cosmetics company and he is has just come back from the US to RULE! (I'm not even sure what his motives were, but they weren't good.) And he didn't care about anything or anyone because as we learn quickly, he will probably die in a month from a heart condition if he doesn't get a transplant donor. Then we have our girl who is the secretary for this company. They clash right off the bat of course and she can't stand him and he is intrigued, but seemingly not in a good way. Like he is out to torment her. Meanwhile, she gets engaged to the local detective dude and all is well. For a few minutes anyway. And this next bit is sort of a spoiler, but is basically the premise for the whole show and happens in episode two, I think... so yeah. That's your spoiler warning. There's another guy. He's been friends with the secretary and the detective for years.. but he has issues. And the detective learns that he is responsible for a scandal that has just gone down within the company and he confronts this guy and says... turn yourself in or else. Well. Next thing we know the detective gets run down by our dude with issues and is rushed to the hospital where he dies.... sad. At the same time, our ruthless CEO dude collapses from heart failure and is rushed to the hospital.... and ends up getting the heart transplant he needs... from the detective dude. And he doesn't die. Yeah. So when he wakes up, he starts changing. And he is drawn to the secretary and she to him. And things get weird and complicated. I wasn't sure if I liked him at first, but he really grew on me! There's a great bromance (see the dude behind) in this one too! Many things happen after that with the company issues and changes of personalities and the TRUE mean dude (who I liked dang it!) and relationships with parents and trying to figure out what makes a person themselves... their heart? Or.... what???? I loved seeing the main guy change through the course of the show and in fact he actually becomes one of the cutest, most boyish, sweetest freaking characters I've seen! Like... he has NO filter and just... it's all out there. And he totally turns from this jerk to this sweetheart. Best thing ever. 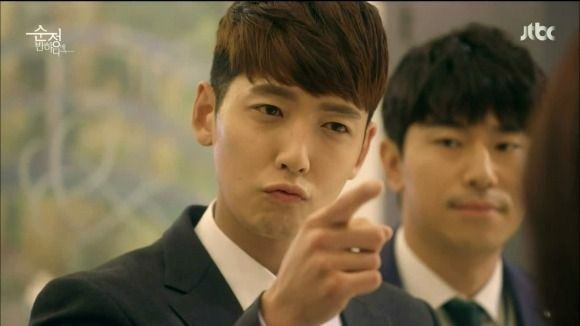 And here's the cute second lead guy who ends up meaner than the first mean guy! The ending... is weird. But not weird enough to make me not like the show overall. And still satisfying. I think these crazy endings are sometimes a kdrama trope too, along with so many other awesome things. LOL! It was fun to watch as a little group... we ended up bringing Deanna on board too since just as I started it she was all... what should I watch next? So she watched with us also. Very fun. On Monday, yesterday, BTS the Korean "boy band" group that I gush about a lot, spoke at the United Nations to kick off a new youth program by UNICEF. Seeing them stand there, so dignified and serious, made me so proud and happy. It feels like a sort of pay back to people who make fun of this music and these guys and even other groups, as just frivolous bubble gum dumb boy band music, and shows that they are much more than that. And that they have so much to say that will help the world become a better place... stuff they say all the time in their music, but yesterday they said it just a few smart words delivered by their leader, Kim Namjoon. Stuff like: believe in yourself, speak up for yourself, follow your dreams and passions, don't be put in a box or a mold dictated by race, gender or anything. Don't lose sight of yourself. It doesn't matter if you mess up and make mistakes. You will be wiser tomorrow. It's okay to love yourself. It's a message they've been talking about nonstop for a long time now... and now the world got to hear it. Ah. It's so cool and crazy! Our boy Namjoon, aka. RM did an impressive job. He's truly an amazing person in so many ways. Anyway, I'm just so proud of them and wanted to shout it out. And to share the speech for those that don't listen to their music, but might need to hear this message anyway. They will be on Jimmy Fallon tonight, and Good Morning America tomorrow if you want to see more of them. Believe me, they won't be as serious looking as they looked at the UN... or looking like they are going to church! BUT, they will look amazing and they will have a great time and they will show the world that they are for real and here to stay. This is the second book of the duology of books starting with Six of Crows. So the story continues pretty much right where the first one left off, which was not in a great place! The first book had our heroes (anti heroes?) pulling off an impossible heist. But they were duped. This story is them getting revenge on the duper. We continue to get to know these characters even better. I thought we had them pretty down from the first book, but no.... there's SO MUCH MORE! Which means we just fall in love with them all even harder. It continues, like the first one, to have each of them getting a turn to tell the story. And I love that. So from page to page, we never know what thing they have to deal with next. There's hardly any catch your breath moment. It's intense. This book knows well about the whole put the characters in a hard place concept and see if they can get out of it. So many times I thought... AND NOW WHAT WILL THEY DO? Let's just say they (and the author of course) are ten times smarter than I am. I could never figure out what they could do to solve all their predicaments. Another fun thing about this story, is that we as the readers often have NO CLUE what's really going on, but the characters do. Know what I mean? So we are tricked into thinking... oh man it's OVER now, but in reality, the characters had things in complete control. But since that was always the case... you just never knew! I do wish there had been a touch more romance. The potential is there, but the characters are just not cooperating! The end was great, but I just... AH!.... wanted a little more! But still. Great story. Great characters. Fantastic writing. And now I'm on to finishing the other series... the one that actually came first! Awhile back a couple of kpop idols (celebrities) announced that they were dating and had been for two years... that they were sick of keeping it a secret and that they wanted to share with the world. Of course, while international fans seem okay with the idea.. Korean fans HATE the thought of their idols dating, and so they freaked out. The company for these two then also freaked out and said that they were now on hiatus... and they stopped all promotion for their groups. The dude was supposed to come with his group to KCON but of course he didn't and so we saw his group without him, which was a sad sad thing. So this past week they announced (we think they officially announced... I don't think it was a simple leak) that these two were being fired basically. And kicked out. Well... we ALL went crazy on Twitter and after a day.. the company's stock fell a TON and then they said.. okay wait... wait... maybe we won't fire them. Calm down everyone! So then after a few more days they said... yeah... we will keep them after all... and so now we are all... NO NEVERMIND! WE WANT THEM TO LEAVE AND MAKE ALL THE MONEY WITHOUT YOU! It's such a mess and such total drama. But real lives are messed up. The poor boys left in the group, trying to do their job... keep breaking down in tears. They had to release a new song and MV without him and it's so cute...but it's so hard to know that inside they are all hurting so bad. The dude wrote a letter to fans that was seriously heartbreaking saying he just wanted to live a truthful life and that he never meant to make such a mess. I was proud of him though, for NOT apologizing for actually falling in love... or telling the truth. Anyway. It's still going to be seen what happens, but I hope they figure it all out. It's such a mess. BTS came out with more songs and more awesome MVs. And a complete repackage album of all their recent best stuff. Currently they are on tour in the US and making everyone lucky enough to go to their concerts pretty much die in ecstasy over them. They really are amazing. Of course, we didn't get tickets this time. We tried and failed. They have been nominated for a Grammy... it's in the social artist category, but soon they will be nominated for an actual musical award, I'm pretty sure. Just wait :) They have been having drama of their own with the Korean fans since they wanted to do song on their upcoming Japanese album writen by a dude that the fans do not approve of... so the company listened to the fans... again.. .and pulled the song. Those Korean fans are NOT to be messed with let me just say! I can't think what else to report on for now. But it seems like there's always something going on! Do we still like these Currently posts? Even though I forget to do them very often? We got to see them sing this for the first time at KCON and it was awesome. Watching: I started a little series on Netflix that the husband recommended called Shetland. Based on mysteries by Ann Cleeves taking place in the Shetland Islands off Scotland. Very intriguing. I watched 3 episodes and need to finish the last 3 to see what happens! Still watching lots of dramas. I was excited this week when my friend Jenny got sucked into a drama (FINALLY!) and wanted to talk about it (I feel your pain girl!) and so I dropped the one I was halfway into and started this one with her. It's so good! Beating Again... or Falling in Love with Soon Jung are two... lol. Survivor starts up again soon too I think. Not even sure when, but I said to the husband... "are we watching still" and he said why not, so... why not! Reading: I'm still being captured by the series and world created by Leigh Bardugo. 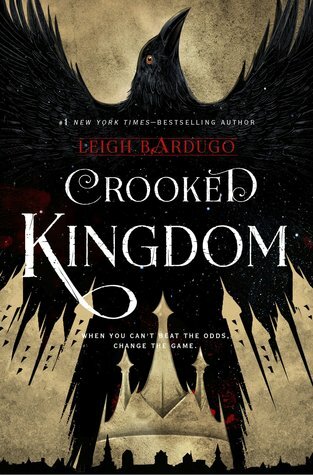 Currently finishing up Crooked Kingdom. Love these characters so much! But they are KILLING ME! AHH!!! Blogging: I decided I need to get all my blogs printed in a hard copy and stuck in binders. I did this for a long time, but got totally behind, so this past week I copied year 2013 of my blog. Wow, but it's fun to look back. I did so freaking much back then!! How did I do that? LOL! Anyway, it's like reliving that whole year again, and it was a pretty great year! This week I hope to get 2014 and maybe even 2015 done. I wonder what I did during those years! But CURRENTLY, I had a dry spell and then I have been doing okay trying to catch up on some things, yeah? I think Bloggiesta is going to be happening later on this month.. and I was wondering about the Readathon too.. I bet it's coming up! And also, I'm wondering what fun weekly memes are people doing these days. Anything? What's a good one to start doing? Suggestions?!!! I need a regular weekly feature to look forward to. YouTubing: Well, as you know KCON was a highlight... being guest panelists at a huge convention. Yeah? But now that high is passing and I'm left wondering what we do next to keep things going. We are sick of doing reactions on the channel, so we are trying to figure out what else would be fun. Sister and YouTube partner Megs will be traveling to Korea in a month and the plan is to have her do travel and experience vlogs for the channel, so we are hoping that will be a fun and popular thing! I still have the most fun compiling song lists, but people don't seem that interested in watching them. It's always a struggle figuring out what people DO want to watch... that's not reactions. LOL. We'll be going to a the local social media conference this week. It's always a good thing for getting ideas and revitalizing the enthusiasm, yes? Asking: Can we PLEASE get some rain? We need the fires out and the smoke all gone.. and we need the weather to cool down! Please???!!! Going to Illinois around Thanksgiving to visit the daughter and family, bond with the 2 year old granddaughter and welcome another granddaughter to the world. Markus Zusak's new book (only a few weeks to go!!) and visit in October! Ah, I think it was a dream that he came here years ago. Did that really happen? I'm so glad it gets to happen again! Hosting another Kpop party at Bumblebees, hopefully in also in October. Did you see the last one? Maybe you even came? Dang, we had a fun and crazy crowd! That's about it that's going on around here. What's happening with you all? I was going to give the drama watching a break... and read. But I finished my book fast, and I crave the dramas after even only a couple of days of not watching one, so I caved and decided to watch this one because it's so short... only 10 episodes. And the episodes are short too, like only 45 min long. And besides it's been on my radar since last year when it aired. This one is about a dude who has pined for his high school crush for ten years. And is so sad that nothing everncame of this love he had. And is still baffled after all this time why she just up and disappeared after high school without a word and never came back. But she suddenly appears in his current life and he tries to approach her. But she is cold and brash and mean and basically drops him flat. So sad. He feels like something is up and he is determined to figure it out. That's when something happens and he finds himself suddenly 10 years in the past when he was in high school. Only wait. He is his current present day self, gone back in time. And so he is a teacher now to his friends, this girl he loves... and himself... from 2007. He's determined to figure out what happened and to change things up a bit so that he can be with this girl.. either now... or in the future. But the minute he gets there, he has already messed things up and dang it, but the girl now has a massive crush him, the teacher, and not him, the student. What to do?? It's great! There are like three parts to this drama. The first few episodes are in the past in 2007 with both our dudes there, both the student main lead and the teacher main lead. Then we come back to the present day 2017, with BOTH our guys again... the student AND the teacher! And then we have the episodes were the guys are both finally back to the proper times, but their memories are so messed up because of the events that have now happened that they don't know what time what happened! Anyway, our lovely student boy (dang I loved him!) thinks he has it all figured out and he is sure he is going to fix things so his future self will be happy once and for all! Our two boys! Their banter is the best! Okay, so my favorite part of this drama was the banter between these two leads. The student character and the teacher character.. because they are the same character, but not really! It's awesome! And they banter like frenemies and big and little brothers or best buds forever. A great bromance drama. And we all love bromance dramas. The other thing I liked was the mother son relationship. Man, these dramas like to play that up. There are great daughter dad ones, and some mother daughter ones... I can't think of good son dad ones because usually those ones are toxic. But the mom son ones really get to me and this one was no exception. So good. The romance was fun but frustrating because the girl was so confused as to who she was in love with, as you can imagine! LOL! And even though it's a short drama, it seemed like it took forever for her to finally figure it out! A love triangle with yourself. Awesome! Anyway, I enjoyed it a lot. Time travel stories are always fun, but they do totally mess with your mind! The teacher dude was played by a guy from the band CNBLUE (those guys seem to get around!) and I've seen him in something else but it took me nearly the whole drama to realize it was him. The kid was someone new I haven't seen before and is so freaking cute. I hope to see him around in more. And this song sung by IMFACT, a band we discovered this year when we saw them at KCON. Awesome! Hey it's our book club book and book club isn't happen for another week and a half and I have the book read already! Things are CHANGING around here!! LOL. I loved this guy's other book, The Rent Collector and this book has had it's fair share of buzz (man I seem to be catching up on all the buzz lately.. well some) and so the book club voted it in and here we are! 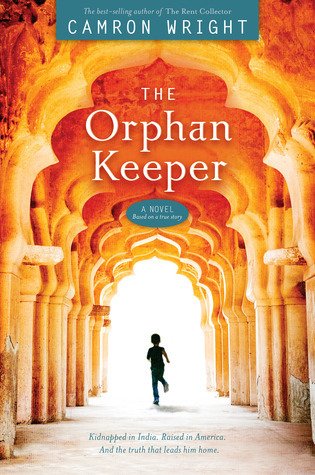 It's about a boy who grew up in India until he was about 8 years old, and then bam, one day he was kidnapped and sold to an orphanage where he was then adopted to an American family, which happened to be located here in Utah. This is that crazy crazy story! Because later when he grew up, he went back and found his Indian family! With hardly ANYTHING to go on. He had no idea what city to look in... and we are talking INDIA here! It's really an amazing story. And I loved it! I devoured this book in fact. The story is novelized to fill in all the missing blanks from when he was a kid and to change around a few characters, but if I'm understanding correctly, it's basically following exactly what happened. Someone just took him off the street one day when he was waiting for his dad and they took him to an orphanage. Luckily, it seems he was treated well and life was actually better for him, but still... his family! His mom! He even tried to escape at one point, but went back to help the sick girl that needed his knowledge because he knew what plant would help her. When he arrived in America, he tried to explain to his new family that he still had a family, but it took awhile for his English to be good enough to get through to them. And once it did, they tried as best they could to figure it out, but everything led to a dead end. So after awhile, they gave up. So it wasn't until he was in college that he started feeling a draw to his country. He meet some wonderful people and they helped him get back (mostly.. he had some resistance too.) And once he was there, he went off just some small clues and started combing the area to figure it out. The way he finally ends up finding them is... amazing. And yes, I cried. Anyway, his life has turned out be be pretty good in the end. And he has been able to live sort of teh best of both worlds. But he still struggles. Because of this question: Is it good that he was kidnapped and taken from his family? Because look at what he has now... and how he has been able to help the people in India... so, was it good thing? Ah, it hurts my heart to try and answer this question! I'm sure we will discuss at book club and find all the answers! The book was beautifully written. Sometimes a touch too flowery in description for my taste, BUT I did devour it and could hardly put it down, so it's obviously engaging and paints a wonderful picture of what life must have been like in India... and afterwards... for this guy. Kdrama Review: Are You Human Too? Drama: Are You Human Too? This is a drama that grabbed me from the very first moment. So much happens in the first couple of episodes! The premise here is that our guy is a robot... his genius mom made him because her human son was kidnapped from her when he was about 10 years old by his grandpa (her father in law) and she was never able to get him back. So he was raised by this crazy powerful guy and so she, because she could, made a robot replacement. The robot is nice, mannerly, kind, rule abiding, sweet, compassionate and etc. The human is... arrogant, mean, ruthless, playboyish, snotty, greedy, and etc. They are as different as can be. The robot, with his adorable smile. One day, the human son is trying to track down his mom, but he is being followed by a hitman hired by the bad guy and is nearly killed. The robot son witnesses this and is freaked out. The mom rescues the human son and begins to nurse him back to health. Meanwhile, she asks the robot son to step into his place in the corporate crazy world so that the bad guys don't know what happened, and so that the human son doesn't lose his place to inherit the company. So they teach him to be all the bad things so he can pull this off. But deep down, he is still all the good things. And it might get him caught! He gives lots of hugs because it's a rule. And so it goes. He has a bodyguard that he had had a run in with as the human, but the robot took a liking to the bodyguard and won her over quickly. She discovers his secret pretty fast. Which was nice (I hate it when secrets like this get dragged on forever!) and she becomes a great ally. And of course, she falls for him. He is TOO DANG SWEET not to fall for! And of course, even if he doesn't have emotion or a heart, or whatever, he totally falls for her too. It's the best thing ever! But wow the story gets complicated and all messed up and so much is happening and dang the bad guys ! And then when the human son wakes up... oh boy. It's not pretty. Robot left, human right. Yeah? And so I loved it. The end was a bit.. weird and frustrated me. I could have thought of better ways, you know? But all in all it was extremely engaging and fun and suspenseful. This drama is another one with a ton of great songs. Here's the one that seems to play at all the best parts! A few of my favorite GIFs I've made lately. Dang I don't know what it is about GIFs that make me so happy! Since I posted last about making GIFs I've learned how to edit them... slow them down and chop off the bits I don't want and zoom in and etc. Way too much fun I'm telling you. Jun (the epic eye roller) and DK (the epic smiler) from Seventeen. I swear I could look at this one forever. Snagged from some random gif I saw somewhere. Yesung (Super Junior) at a recent concert... I think. Or maybe it's from a random selfie? that Toto was wearing his name on her head. See how his eyes and smile get bigger? Minhyuk (Monsta X) from I have no idea what. Dino (Seventeen) from their recent MV Oh My! This movie, found on Netflix, is yet another thing that was making a lot of buzz and so guess what? I watched it the very weekend it came out! WHAT? I know, right? I'm so with it! Anyway, I loved the book, so I had to support the movie, right? And I was really curious what they did with it, and I am happy to report, that... I like what they did with it! Great job movie people! It followed the book quite closely in plot, which is that Lara Jean writes letters to her former crushes just to get the feelings out, but then one day those letters get mailed somehow and then she has to face all these guys. One guy is her sisters just barely ex boyfriend and she can't like him. He is off limits. So when the other guy comes around asking about his letter, Lara Jean pretends to really like him still so that the first guy is thrown off. Well, and so then these two (the second guy Peter) decide to keep pretending they are a thing, just for now, until Josh (the first guy) forgets about things. And in the meantime, they find out that they really click and are comfortable with each other and talk well, and etc. But then stuff happens and Lara Jean isn't sure about Peter any more and feels totally played... even though they were pretending all along. Peter is a great character. The dude who played him I wasn't sure about at first, but I really warmed up to him. Maybe that was the idea, but he ended up great for the part and was really quite endearing. The Lara Jean girl was great too (though I think she looked way too old for the part) but I think the kid that played the litter sister stole the show! She was awesome! I really enjoyed it and am glad I fit it in between all the other things that take my attention! If you haven't watched it yet, you should check it out!